Let’s suppose you need a new vehicle. But instead of looking for the vehicle that best meets your needs, you buy the first flashy sports car you see. Or maybe you’re thrifty, so you pick up a used car with good gas mileage on Craigslist. Over time, you start to see signs that this vehicle isn’t capable of the things you really need it to do. Sure, it can take you from Point A to Point B, but it can’t tow your boat. And you can’t haul loads of dirt, rock, or lumber when you do projects around the house. And there’s no room for your toolbox. And it can’t handle rough terrain or snow. What you really needed was a truck, but you didn’t really consider that when you bought the car. This might seem silly, because we usually put a lot of thought into big purchases—especially ones that will affect us for several years. But many health plans don’t realize that the signs of a poor provider portal strategy are just as visible. The best portals equip providers to streamline services, deliver higher quality care, and lower costs. But some health plans don’t take the time to think through what they really need, and how a provider portal fits into that. So they get something that “checks the box,” like a car that gets you from Point A to Point B, but doesn’t do the other things you need. Here are seven signs that you need to take another look at your portal strategy. What if when you wanted to create a new Facebook account, you had to submit a request and wait for Facebook to approve it? Or worse, you had to call them to confirm who you were? Or let’s say you needed to change your billing information on your Amazon account, and you had to jump through the same series of hoops and wait for Amazon to manually make the changes. It would be ridiculous, right? But the reality is, we’ve come to expect this same self-serve model for any type of account creation. So if your provider portal doesn’t have a secure registration system that lets providers add employees and change admin privileges on their own, you’re holding them back and creating a pointless (and costly) bottleneck. You don’t have to sacrifice security for the sake of simplicity. Take some time to walk through the account creation process. How long does it take? How does it affect your providers if they have to wait to get access to the things they need? But onboarding isn’t just about account creation, either. What happens when someone first logs in to your portal? How do they learn about how to perform basic tasks? Does someone have to personally train them to do every task? Are the training materials buried in an email to the provider? At the very least, you should have training videos and/or articles accessible within the portal itself. That way learning how to use your system follows the self-serve model people are already accustomed to, and providers don’t have to call you to help them work through basic tasks. When your child becomes a teenager, it would be a lot less impressive if they handed you art they made with macaroni. Years ago, it was an amazing representation of their creativity and what they were capable of, but now this would be a little embarrassing. Technology has come too far for health plans to be content with clunky, unintuitive technology. Whether you built your portal yourself or you got it from a vendor, the tools you ask providers to use directly reflects on your brand, and has a big impact on how your providers feel about working with you. Why should you care? Because providers compare your portal to others every day. Most providers aren’t just working with you, and they use multiple portals on a regular basis, depending on which patients come through the door each day. Your digital solutions should feel like a first-class experience. It should match the standard of excellence that you want your providers to associate with your name. A provider portal can integrate with the tools your providers use to serve your members. But not all of them do. A lot of portals only integrate with a handful of digital tools, which your providers may or may not use. When a portal integrates with the programs and functions providers actually use, it reduces the time it takes to perform tasks and decreases the risk of inaccuracies that come from manually moving information from one tool into another. At Healthx, we’ve integrated our platform with more healthcare tech than any other vendor. That means we’re more likely to already have the integrations your providers need, and if we don’t, we can create new integrations faster than anyone else. If your providers have to call you to get the most current information, that’s a huge red flag that your portal isn’t cutting it. You could be saving a lot of time and money by investing in tools that update data in real time. And a portal that shows providers outdated information is just begging someone to make a costly mistake. What’s the point of even having a portal if it’s out of sync with your servers? It’s clearly not serving its purpose. Have you ever had someone ask you a question they could’ve easily Googled? It seems lazy, because we know that there’s a simple way to answer these kinds of questions without taking up someone else’s time. When providers call you to ask basic questions, it’s not a sign of laziness—it’s probably a sign that your portal is too complicated, or that you haven’t taught them how easy it is yet. Even if your portal has all the information and functionality your providers need, they still have to know how to find it. And they need to believe that finding that information on their own is easier than asking you to find it for them. If they don’t, it could be a symptom of poor onboarding. Or poor design. Or it could simply be the result of years of communicating directly with your staff to handle basic tasks. Whatever the cause is, if your providers are calling you to request information they already have access to, it’s a sign that you need to point them to your digital solutions more often, or in more ways. When your staff answer calls like these, they should always end the call by telling your provider where they can find this information in the future. Ideally, they would even take the time to show them over the phone. It takes a little more time up front, but it saves your staff a lot of time in the future. When your members receive the highest quality care, satisfaction goes up, and costs go down. It makes you look good. And it makes your providers look good. But even highly knowledgeable, well trained providers can fall behind on compliance standards or slip in quality metrics. Without the right tools, they’ll struggle to identify gaps in care for their patients, and to proactively schedule appointments and drive healthy behaviors. Without the right data, they’ll have a hard time making the best choices for your members. And even if they’re keeping a close eye on changes within the industry, they may have a hard time connecting those changes with their day-to-day services. Healthx gives your providers at-a-glance data in a helpful dashboard, and lets you make recommendations based on that data, so when they pull up a patient’s information, they’ll have a notification about any gaps in care and what needs to happen next. You can also publish documents right into the provider portal, so you can help them stay informed about how they need to adapt to new compliance standards, legislation, and other changes to the industry. Imagine if Google didn’t prioritize the websites that best fit what you were looking for. A search for “HIPAA standards” would pull up a handful of random pages that mention HIPAA standards, instead of websites that are about HIPAA standards. Suddenly Google wouldn’t be very useful. Similarly, when your providers use your portal, the first information they see should be the most useful. These are the things they need to perform basic tasks like confirming eligibility, checking payment status, and verifying lab results. If your providers have to hunt for the most useful information every time they use your digital solutions, your portal hasn’t been designed with them in mind. We know what the best provider solutions look like. We know what the worst ones look like, too. That’s why we wrote The Provider Platform: Why Portals Aren’t Good Enough. 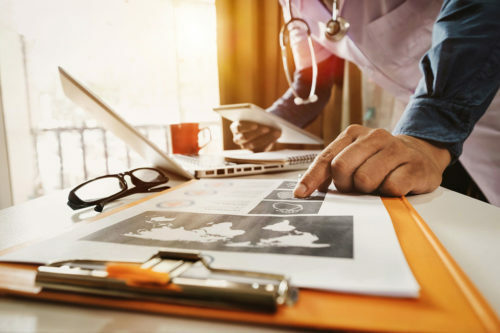 Inside you’ll find an honest look at why so many health plans give their providers sub-par digital tools, how you can make your providers more efficient, and ultimately, how to help your members get the best experience from their care.